I did months of research scouting out the perfect small town destinations for a European road trip. Finding a balance between charming and boring proved to be my toughest challenge. I can stroll down little streets and sit on cute benches all day, but on day 2 we like having something different to do. Deciding which towns to stop by and which towns to stay in can be a very important part of your planning! We started our journey in Germany, with our first stop being Cochem. A beautiful little town on the Mosel River. I talk all about it in this post. From Cochem we drove to Colmar France which sits just off the border of France and Germany, needless to say, our drive was spectacular! Accommodations:Hotel Saint-Martin, a lovely hotel right in the center of town. Very cozy and traditional. Things to do: Shopping, Cafes, Bars and Restaurants, Beautiful Walks. 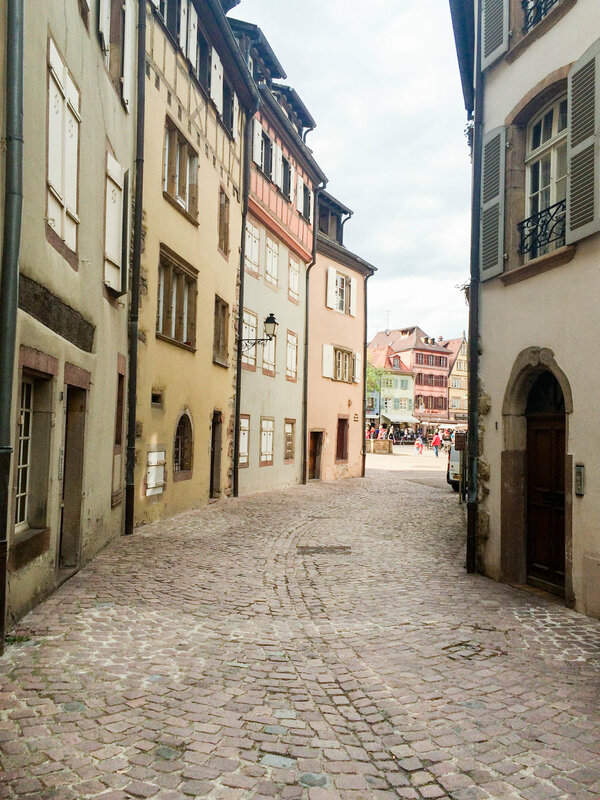 Our route from Colmar to Annecy took us through Switzerland! So, we stopped for lunch and a few pictures in Lusanne and Geneva. Side note: to drive in Switzerland at all, you must purchase a tag for the car when you cross the border. I believe ours was 40 CHF (currently about $41). The beautiful drive was well worth it though, the Swiss Alps are breathtaking! Lac d' Annecy sits just below the Switzerland border and just west of Italy. On one side of the lake a little French village and on the other a mountain range. Quite the view! Fun fact about Annecy, at least the historic region (which is what you are looking for), there are no cars! We parked our car on a side street and walked right into a little fairytale. To make it better, Annecy has lots to do! There are bikes available for rent and boats you can take out on the lake. A large grass area by the lake is perfect for a picnic or lounging in the sun. The evenings were lively, people around delighting in the surrounding bistros and bars. We even found a beer tavern where you can preload a card and swipe it as you pour yourself a taste...or a pint of any of their draft beers. Things to do: Bike Riding, Boating on the Lake, Picnic by the Lake, Restaurants and Bars, Surrounding Outdoor Activities. Keep driving south along the border of Italy and before you hit the coast, you’ll find Eze, looking over the French Riviera. This part of our drive got very expensive… there is a significant amount of tolls to pass as you make your way through the southwestern part of France. Driving was still worth the convenience, freedom, and view. Just be forewarned to include a couple hundred dollars in tolls into your budget haha. Eze is a gorgeous medieval town perched atop the hilly coast of the French Riviera! I fell in love the first time I saw a picture and quickly penciled it into our itinerary. The entire village is stone, the walkways, the walls, the stairs; if you’re a cobblestone fan, this is the place to be! However, despite its obvious charm, I would consider this town a little too small. Once you walk around; enjoy the garden that overlooks the coast (there is an entry fee) and a cappuccino from the outside cafe, you have seen it all. Though beautiful, I would make it a stop on your way to Nice or Portofino (personal favorite) for the afternoon to enjoy the sights and then be on your way. Things to do: Enjoy the sights and a cappuccino or hike down to the coast. Best to stop by for the afternoon! Train Station: Take a bus from the Nice train station, Gare de Nice-Ville. Find helpful bus information on getting to Eze from Nice here. Renting a car in Europe can make traveling super convenient! No need to look up train schedules, buy tickets, take taxis, or buses. Just put your hotel address into the GPS and enjoy a beauty of a European roadtrip. I would definitely recommend it if you are branching out from the big cities. We were a little hesitant at first when deciding to rent a car in Germany and then drive it through France, Switzerland, and Italy...but it was amazing! Here are some helpful hints if you're interested in trying it out. Each country has a variation of their terms and conditions, but most of Western Europe is pretty consistent. We used Europcar and had no problems. I think our biggest concern was that we needed to return our car to the same country we rented from, which meant back tracking. Most countries allow you to rent a car at 21 with the occasional young driver fee, but at least it's an option! Many reviews say you need an International Driving Permit, we didn't. Our drivers license and passports worked just fine on their own. But again, it varies per company and country so unfortunately, there is no definite answer... sorry! If you are having trouble getting specifics try emailing them! There is some additional information about renting cars in Europe and Europcar specifically here and here.